This Oreo Milkshake recipe requires 3 ingredients and 5 minutes from start to finish. Thick, creamy and easy to make this homemade shake is just what you want to sip all day. Here is how to make Oreo Milkshake at home. Who doesn’t love Oreo cookies right? Whether you eat it all at once, twisted apart-licking the cream off, dunked with milk or just slowly nibbling away. We sure do love eating them, but have you tried making a milkshake out of Oreos? This Oreo Milkshake Recipe is super easy to whip up, and it’s going to be a big treat for the kiddos. So the next time you see them sad or down, just make this luscious creamy oreo shake and watch that smile appear on their face. This Cookies and Cream Milkshake is apt for any occasion and makes for a delicious tea time treat. You could also make it for a birthday party and see how the kids satisfy themselves by slurping it away. Making a really good milkshake is really simple but a few tips here and there takes it to a next level. The most common mistake I have seen people doing is adding all the ingredients in the blender all at once. Now if you do that, there might be some pieces of fruits or cookies that will not be blended properly in the shake and you will have chunks coming through when you sip. The best way to prevent that is to add all the ingredients in the blender except milk. Add a little milk first and blend until everything comes together. Now add the rest of the milk and blend well. Your creamy smooth milkshake will be ready in no time. Adding ice cream to your shake makes it really creamy and rich but you can choose to skip it if you are looking for a healthier option. Vanilla ice cream works best in any flavour of shake. So you don’t have to buy multiple ice cream flavours to make multiple flavour shakes. Freezing the milk until it is semi set also makes the shakes really creamy and thick. If you are using fruits in your shake, freeze them for a few hours to make a creamy and thick shake. Chilling the serving glasses for a few hours before serving is a great idea to make an outstanding milkshake. You can top your milkshake with whipped cream as well. Check out my recipe to make Strawberry Milkshake which is beyond delicious. How to make Milkshake without a blender? To make a milkshake without a blender, add milk and ice cream in a glass with a tight fitting lid and shake vigorously. Add the flavour of your choice and mix well. If making oreo shake, crush the oreo using a rolling pin and then add it in the shake. To make Oreo Milkshake, you will need just 3 basic ingredients and that is Oreo cookies, milk and vanilla ice cream. use full fat milk to make this shake to give a nice creamy texture and a rich feel. I have used the classic Oreo Cookies with white filling but you can also use chocolate Oreo for a chocolaty shake. How to make Oreo Milkshake? 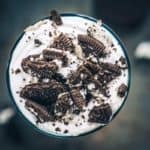 To make this delicious Oreo cookie milkshake or cookie and cream shake, first the glass is prepped by pouring some decadent chocolate syrup on the sides. A beautiful pattern is created on the inside of the glass and it’s refrigerated for a few minutes so that the chocolate sets completely. Then the Oreo cookies, milk and two scoops of vanilla ice cream are put into a blender and mixed until it becomes a smooth shake. The shake is then poured into the chilled glass. Next, to make the Oreo milkshake look absolutely irresistible, some whipped cream is added on top and drizzled with crushed Oreo cookies. The key to getting the texture right is not to over blend the milkshake, else you’ll end up with a very thin consistency. This Oreo shake is a sensational drink and quite popular among adults and kids alike. But trust me; this drink is not for the light hearted, only if you’re a sweet lover are you going to love it. So the next time you’re planning on whipping up a drink, try this delicious creamy Oreo shake. Some of the other drinks you could try this summer are, Dates and Honey Milkshake, Banana Strawberry Milkshake, Mango Ginger Lemonade, Mango Banana Green Smoothie, Mango Peach Shake or you could make a delicious Chocolate Milkshake by mixing some of this Chocolate Fudge Sauce with cold milk. 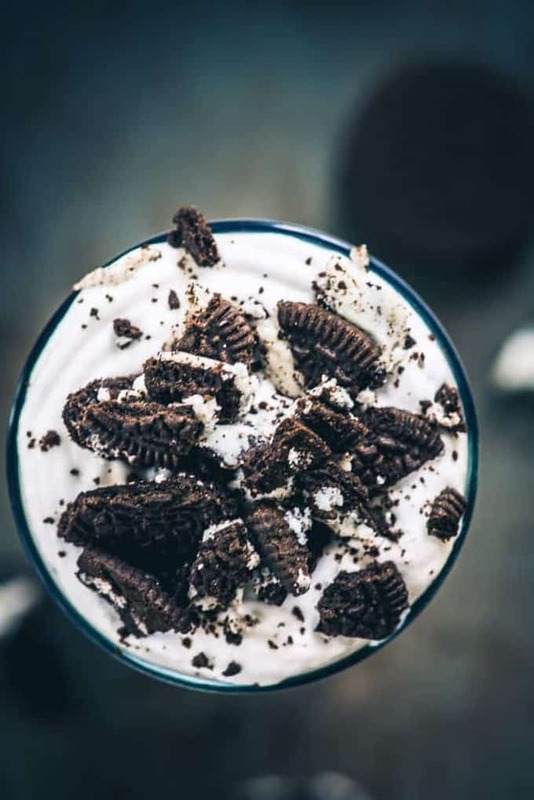 Oreo cookies are so yummy as it is, but add a bit of vanilla ice cream and milk to watch how it can be transformed to something simply divine. This drink requires just three simple ingredients and it’s sure to be the kid’s summer favourite. It might have a bucket load of calories, maybe even a day’s worth of calories, but who’s counting calories, just slurp away. This is the Oreo Milkshake Recipe which you can make in under 5 minutes with just 3 ingredients. Here is How to make a Cookies and Cream Milkshake. Take a glass and pour some chocolate syrup on the sides. Swirl the glass to coat it with chocolate syrup in a pattern. Refrigerate the glass for a few minutes. Add oreo cookies, milk and vanilla ice cream in a blender and blend to make a smooth shake. Pour the shake in the prepared glass. Sprinkle some crushed cookies on top. Okay, haven’t even tried this yet and I’ll already hand you a gold medal for best milkshake. This looks beyond perfect! Wow, Will try this definitely. Do try. It tastes delicious.